According to my audiobook I’m about 2/3 of the way through Catch 22 at this point. Some highlights have included Milo’s unapologetic business savvy and numerous schemes to feed “the syndicate’s” bottom line, and how Nateley falls in love with a prostitute, which he will never tell his father about. You may think that it’s taking me a rather long time to work my way through this book, and you would be right to say so. It isn’t however, because of the actual book itself. No, I’m sure that if I sat down with Yossarian and the boys and I could push that out in a couple of days (I could do it, I just don’t want to). But I’ve been somewhat distracted lately. A couple of books have lead me astray from Heller. 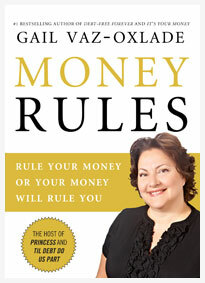 The first is Gail Vaz-Oxlade’s Money Rules – a book about not being a complete idiot when it comes to managing your money. The rules consist primarily of advice which most of us (with any financial self-awareness) would consider to be obvious. I think what struck me the most when reading this book is that there is a need for it. What I take for granted as a given (eg: don’t spend more than you make, savings are important, and minimum payments are only good if you want it to take a decade to pay off $500) others are completely oblivious to. Apparently not everyone has had the good sense to have one (or two) of their parents be accountants. Some people are raised with the fear of God. I would say I was raised with a healthy fear of debt and financial instability. Budgeting was one of the very first skills I was taught as a child. I think I learned budgeting before I learned cursive. At some young age (I still had a tiny Disney’s the Little Mermaid desk) I remember being given my allowance, and I had to put away a certain amount for savings, then some for charity, and whatever I had left over was spending money (aka candy). Since then my budget has changed drastically – candy no longer accounts for a third of my spending – but the idea is the same. Those of you out there who know me personally may even say I’m a little bit obsessed with it. Do I wish I was better at strictly following my budget? Of course, doesn’t everyone? But at least I know when I’m overspending, and have a plan on how to fix it relatively quickly. OKAY. SO. This quickly veered off the path of an update on my reading of Catch 22. See how easy it is to get distracted? I’ve also been sidetracked by a little book called The Everything Wedding Etiquette Book because, as it turns out, I’m getting married (insert happy dance here)! It also turns out that weddings have a lot customs, rules and traditions of which I was completely unaware. And what do we do when we realize we know nothing about something it would serve us to know at least a marginal amount about? We go to the nearest Chapters and buy a book on the topic, of course! So I did that, and now I’m learning that you have to budget a massive amount of money for gratuities, what order the toasts are supposed to happen in, and what traditionally happens when a Catholic marries a Protestant. I have had to do quite a bit of driving in the past couple of weeks for work, most notably four 2 1/2 hour blocks in the car to listen to my audiobook. This listening chunk is largely responsible for the progress I’ve made in the book. It’s also left me convinced that I am not giving ol’ 22 a fair shake. I’ve found that with this particular book, unlike other books, I tend to enjoy it more when I’m reading it, as opposed to listening to it. This is not meant to be a criticism of the narrator, in fact I think that Jay O. Sanders does a good job of it. Instead, I believe it to be a reflection of the amount of attention I’m able to pay to an audiobook when driving on one of the most dangerous stretches of highway in Southwestern Ontario. Catch 22 has SO MUCH GOING ON ALL THE TIME (yes, all caps were necessary) that you really can’t do the whole tune-in-and-out thing with it and still fully appreciate and understand what’s going on. For that reason, I am going to try to read the rest of the book. Sanders – you’re out, Eyes – you’re up!